The Center for Applied Research in the Apostolate (CARA) at Georgetown University recently released its annual report on vocations to the religious life. “New Sisters and Brothers Professing Perpetual Vows in Religious Life: The Profession Class of 2014”, which was presented to the United States Conference of Catholic Bishops in late January, provides a glimpse into the background of the men and women who professed their final vows last year. Sadly, the study also identifies the continued decline of religious life in the post-conciliar era, as nine in ten orders reported zero members professing perpetual vows in 2014. 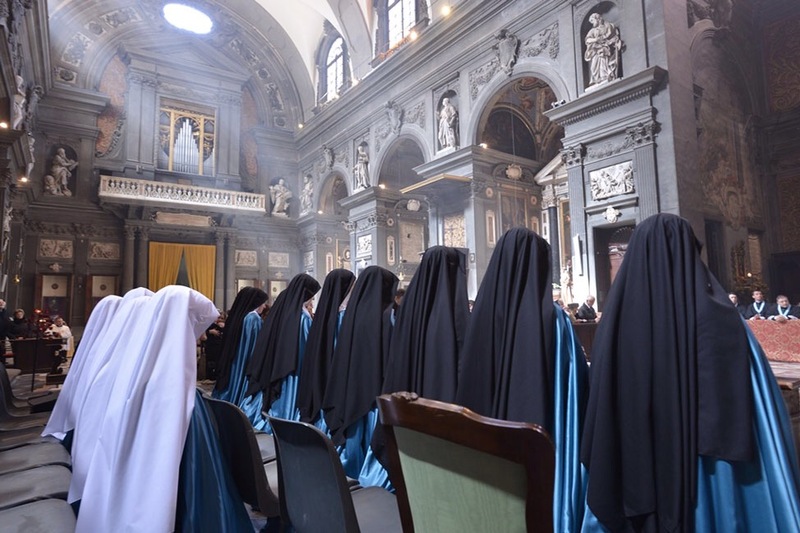 During the course of their research CARA identified 190 women and men religious professing final vows, with a total of 77 sisters and nuns and 41 brothers completing the survey, representing a response rate of 62 percent. While the survey itself captures data such as ethnicity, educational achievement and private prayer practices, what it reveals about the importance of family for producing vocations is truly eye opening. More than eight in ten respondents (83 percent) come from families in which both parents are Catholic. More than one in three (36 percent) of these responding religious have four or more siblings. CARA also reported similar findings for the 2013 survey. Of the 107 identified women and men religious professing final vows that year, a total of 80 responded to the CARA survey: 69 sisters and nuns and 11 brothers. Almost eight in ten (77 percent) came from families in which both parents are Catholic. Additionally, the CARA study found that nearly half (47 percent) of those who professed their final vows in 2013 had four or more siblings. At a time when the majority of self identified Catholics accept the notion that two kids per household is the ideal, these families of five or more children are irrefutably counter-cultural. However, with over a third of respondents in 2014, and nearly half in 2013, coming from such large families, the facts speak for themselves. Put simply, the CARA findings repeatedly illustrate the foundational role families play in producing vocations. The importance of both parents being Catholic and open to life cannot be overstated. Where Catholic marriages reject the contraception-crazed culture, families are blessed with children, and the Church with vocations. Let us hope that, as we move forward, more in the Church will highlight the important role that large families play in producing vocations to the religious life. Any study of the vocations crisis of the past several decades has to include a serious discussion of contraception and its negative impact upon vocations. In the coming years may we see more large families serving as a witness to hope through their self-giving and sacrificial love, and may an abundance of supernatural grace and religious vocations result from their obedience. Posted on February 14, 2015, in life and tagged cara study, catholic families, large families, perpetual vows, religious vocations report 2014. Bookmark the permalink. 2 Comments. Amen! I look forward as time forward unfolds to see where my 7 children 13&under will be called! While many of the points in your article are valid, please use some sensitivity when asserting “open to life = large families” and “small families = contraception”. Many families are small because of infertility, illness, marriage at a later age, serious reasons to space pregancies by periodic abstinence etc. These couples are not contracepting but are often unfairly judged because they have fewer children.